EU Law and Healthcare Services. 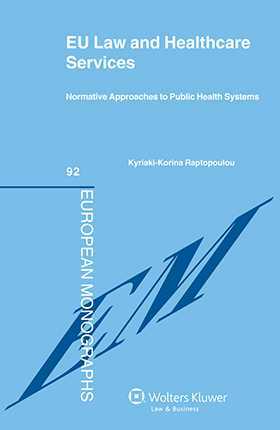 Normative Approaches to Public Health Systems focuses on the EU legal mechanisms surrounding healthcare law in Europe. You will benefit from a detailed examination of the extent to which the market imperatives that have been introduced in recent decades can actually influence, remodel, alter, unify, or fragment the national provision of health care services across the EU. This book takes a giant step towards bringing the frequently invoked criteria of universality, access to good quality care, equity, and solidarity to the fore, and for this reason is sure to make its mark on healthcare law in Europe. How will this publication benefit you? Quickly find the information you need with analysis that draws on a wide range of sources and materials, including public health economics and public health policy literature, case law of the European Court of Justice and the General Court, EU secondary legislation, soft law instruments of the EU institutions, and relevant legal scholarship. Gain full understanding with innovative insights from the author, notably the emphasis on the dynamics of supply and demand and the masterful elucidation of the underlying conflicts between economic policy and social protection. PART I Unravelling the Demand Side of Public Health Systems: The Patient as a Worker or as a Consumer? Chapter 1 Healthcare as a Benefit under Social Security Coordination and the Worker as a Patient. Chapter 2 Healthcare as a Service under Article 56 TFEU and the Patient as a Consumer. Chapter 3 The Patients’ Mobility Case Law Acquis as a Source of Silent Harmonization. Chapter 4 Healthcare Provision for the (Migrant) Patient on the Basis of Secondary Law: From Coordination to Harmonization or Both? PART II Unravelling the ‘Supply Side’ of Public Health Systems: The Regulatory and Redistributory State under EU Law. Chapter 5 The Regulatory State and the Free Establishment of Healthcare Providers. I The Way so Far. Table of Legislation and Other Instruments.